This image shows the Mars Exploration Rover Opportunity perched on the edge of Concepción Crater in Meridiani Planum, Mars. Concepción Crater is a fresh, 10 meter-diameter crater with dark rays that clearly overprint the north trending aeolian ripples. 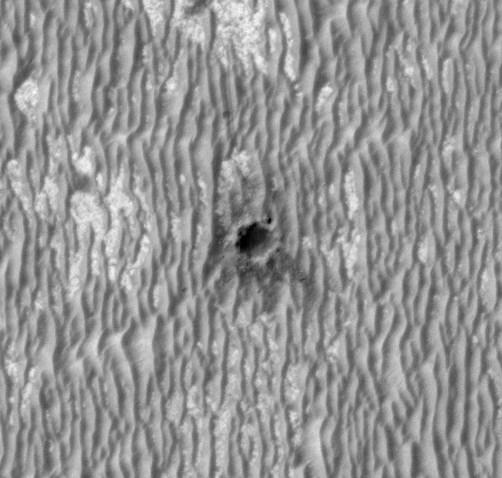 The dark rays are produced by shadows cast by blocky ejecta and the presence of the rays and similar relationships with other fresh craters in Meridiani Planum indicate that this is likely the youngest crater visited by either rover on Mars (estimated to have impacted thousands to tens of thousands of years ago). This image was acquired by HiRISE on 13 February 2010, on sol 2153 of Opportunity’s mission on Mars. Note the rover tracks in the ripples to the north and northwest of the rover. Scientists use these high-resolution images (about 25 cm/pixel) to help navigate the rover. In addition, rover exploration of areas covered by such high-resolution images provides “ground truth” for the orbital data.